Honda Civic Type R EP3 (2001 – 2005). Mugen Real Carbon Fiber 6 Speed Gear Knob. Honda Integra DC5 (2001 – 2006 ). Honda S2000 AP1 (1999 – 2005). Honda S2000 AP2 (2005 – 2009). Honda Civic FD2 (2006 – 2008). Honda Civic Type R EP3 (2001 – 2005). Grey Mugen 6 Speed Gear Knob. Honda Integra DC5 (2001 – 2006 ). Honda S2000 AP1 (1999 – 2005). Honda S2000 AP2 (2005 – 2009). Honda Civic FD2 (2006 – 2008). Honda Civic FN2 (2008 onwards). Honda Civic Type R EP3 (2001 – 2005). Mugen Real Carbon Fiber 6 Speed Gear Knob with Red Stripe. Honda Integra DC5 (2001 – 2006 ). Honda S2000 AP1 (1999 – 2005). Honda S2000 AP2 (2005 – 2009). Honda Civic FD2 (2006 – 2008). Honda Civic Type R EP3 (2001 – 2005). 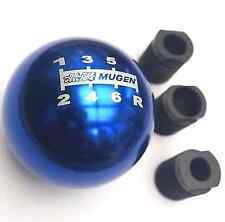 Blue Mugen 6 Speed Gear Knob. Honda Integra DC5 (2001 – 2006 ). Honda S2000 AP1 (1999 – 2005). Honda S2000 AP2 (2005 – 2009). Honda Civic FD2 (2006 – 2008). Honda Civic FN2 (2008 onwards). Honda Civic Type R EP3 (2001 – 2005). 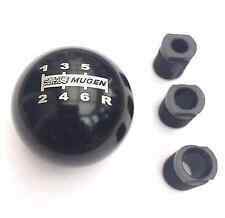 Black Mugen 6 Speed Gear Knob. Honda Integra DC5 (2001 – 2006 ). Honda S2000 AP1 (1999 – 2005). Honda S2000 AP2 (2005 – 2009). Honda Civic FD2 (2006 – 2008). Honda Civic FN2 (2008 onwards). Honda Civic Type R EP3 (2001 – 2005). 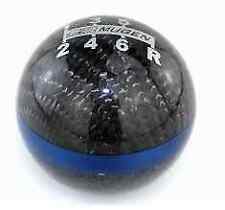 Mugen Real Carbon Fiber 6 Speed Gear Knob with Blue Stripe. Honda Integra DC5 (2001 – 2006 ). Honda S2000 AP1 (1999 – 2005). Honda S2000 AP2 (2005 – 2009). Honda Civic FD2 (2006 – 2008). MUGEN Carbon Gear Knob. 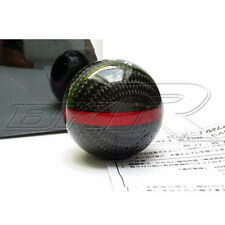 Spherical shift knob is made by laminating aluminum material with dry carbon. The optimal 50mm size and the feeling of weight contribute to solid shift work. These products are available in two colors: Red and black. MUGEN Aluminium Gear Knob. M10x1.5 Thread Pattern, Suitable for all Honda. MUGEN ALUMINIUM MACHINED GEAR SHIFT KNOB. This does not affect your statutory rights. MUGEN LEATHER GEAR SHIFT KNOB. MUGEN Leather Gear Knob. Spherical shift knob features genuine leather wrapped onto aluminum. The optimal 50mm size and the feeling of weight produce solid shift work. Honda Civic Type R EP3 (2001 – 2005). Red Mugen 6 Speed Gear Knob. Honda Integra DC5 (2001 – 2006 ). Honda S2000 AP1 (1999 – 2005). Honda S2000 AP2 (2005 – 2009). Honda Civic FD2 (2006 – 2008). Honda Civic FN2 (2008 onwards). (Genuine MUGEN STEERING WHEEL (RACING III). (REQ STEERING BOSS) VSA & SRS DISABLED). MUGEN Gear Knob. Genuine Mugen accessory. Once they're gone they're gone! This does not affect your statutory rights. MUGEN Aluminium Gear Knob. M10x1.5 Thread Pattern, Suitable for all Honda. 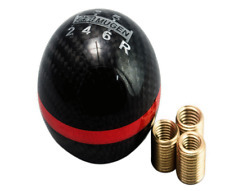 MUGEN ALUMINIUM MACHINED GEAR SHIFT KNOB BLACK. This does not affect your statutory rights. Genuine Mugen short shifter for Honda Civic fd2 type r.
New Black with red stitch gaiter. 5 available. Red Manual MUGEN Carbon Sport Gear Shift Knob for Honda Civic. Model: For All Honda cars and other model cars / w 6 speed. We are able to work with you to resolve any issues. The images are for reference only. 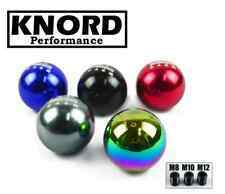 Carbon Black Manual MUGEN Sport Gear Shift Knob for Honda Civic Fit Acorrd S2000. Model: For All Honda and other model cars / w 6 speed. Color: Black (as picture). MUGEN LEATHER GEAR SHIFT KNOB BLACK. MUGEN Leather Gear Knob. Spherical shift knob features genuine leather wrapped onto aluminum. The optimal 50mm size and the feeling of weight produce solid shift work. GenuineMUGEN SPORTS PEDAL SET (MTM). Fits Honda Intera DC5/RSX Civic EP3 Type R. Complete with Full Fitting Kit. Black Manual MUGEN Carbon Sport Gear Shift Knob for Honda Civic. Model: For All Honda cars and other model cars / w 6 speed. The images are for reference only. We are able to work with you to resolve any issues. Black Manual MUGEN Carbon Sport Gear Shift Knob for Honda Civic. Screw Threads： M10 x P1.5. Model: For All Honda cars and other model cars / w 6 speed. Color: Black (as picture). The images are for reference only. Honda Civic FN2 (2008 onwards). Honda Civic Type R EP3 (2001 – 2005). Mugen Real Carbon Fiber 6 Speed Gear Knob. Honda Civic FD2 (2006 – 2008). Honda CR-Z (2010 onwards). Honda Integra DC5 (2001 – 2006 ). Honda Civic FN2 (2008 onwards). Honda Civic Type R EP3 (2001 – 2005). Mugen Real Carbon Fiber 6 Speed Gear Knob. Honda Civic FD2 (2006 – 2008). Honda CR-Z (2010 onwards). Honda Civic Type R EP3 (2001 – 2005). Honda Integra DC5 (2001 – 2006 ). Honda S2000 AP1 (1999 – 2005). Honda S2000 AP2 (2005 – 2009). Honda Civic FD2 (2006 – 2008). Honda Civic FN2 (2008 onwards). RED COLOR Carbon fiber Universal Genuine Carbon Fiber Mugen Five / six Speed Manual / Automatic Spherical Gear Shift Knob For Honda Acura/TOYOTA GSK06. 1X Shift Knob. Material: Real Carbon fiber. No modification needed easy installation. Fits :EK9 EP3 FN2 DC2 DC5 S2000. Mugen Carbon Fibre 6 Speed Gear Shift Knob with RED stripe. Material: Carbon fibre. Performance Auto Trim. When problem arise?. Use of this product is voluntary and the user accepts all responsibility for correct use and installation. Honda Civic FN2 (2008 onwards). Honda Civic Type R EP3 (2001 – 2005). 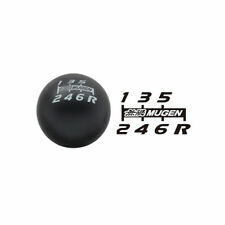 Mugen 5 / 6 Speed Gear Knob. Honda S2000 AP1 (1999 – 2005). Honda S2000 AP2 (2005 – 2009). Honda Civic FD2 (2006 – 2008). Leather cover with contrast stitch. MUGEN Aluminium Gear Knob. M10x1.5 Thread Pattern, Suitable for all Honda. 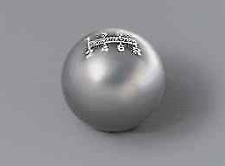 MUGEN ALUMINIUM MACHINED GEAR SHIFT KNOB SILVER. This does not affect your statutory rights. MUGEN LEATHER GEAR SHIFT KNOB RED. MUGEN Leather Gear Knob. Spherical shift knob features genuine leather wrapped onto aluminum. The optimal 50mm size and the feeling of weight produce solid shift work. MUGEN Aluminium Gear Knob. M10x1.5 Thread Pattern, Suitable for all Honda. MUGEN ALUMINIUM MACHINED GEAR SHIFT KNOB RED. This does not affect your statutory rights. Universal Genuine Carbon Fiber Mugen Five / six Speed Manual / Automatic Spherical Gear Shift Knob For Honda Acura/TOYOTA GSK06. 1X Shift Knob. Material: Real Carbon fiber. No modification needed easy installation. BRAND NEW 4x RED MUGEN Honda Car Door Lock Seal Cover Protector Civic Racing Features: Size:6.9*5.3*0.9cm(About 2.72*2.09*0.35inch) Package:0.05kg(About 0.11lb) Product Name:Car Door Lock Protection Cover Material:Stainless steel Package:4pcs/set Purpose: decorative protect the panel, prevent corrosion Installation Instructions: Clean the car surface, keep it dry, Easily Installtion No Drilling No Damage Please feel free to view any other items I have for sale Any Questions, feel free to ask. BRAND NEW Mugen style RED straight Aluminium throw shifter gear knob Easy to Install,OEM Fitment and Quality,No install Instruction. We also have other colours if you check out our other listings! Any Questions, feel free to ask. Mugen Black/red Honda racing steering wheel. fits ep3/dc5 new, been in boot for a while so shows some signs or wear nothing major one bolt missing shown in photo and the middle Mugen sticker is cracked easy buy from eBay to replace, Can post buyer pays postage fee of £7. any questions please ask. Dispatched with Royal Mail 1st Class. Fits :EK9 EP3 FN2 DC2 DC5 S2000. Mugen Carbon Fibre 6 Speed Gear Shift Knob with BLACK stripe. Material: Carbon fibre. Performance Auto Trim. Use of this product is voluntary and the user accepts all responsibility for correct use and installation.